On 18 February 2016, Mr. Serpa Soares gave the Annual Otto L. Walter Lecture on the topic "Building an international rule of law". He was introduced by Mr. Lloyd Bonfield, Professor of Law, and Director, Center for International Law, New York Law School. Others in attendance included Mr. William LaPiana, Associate Dean, New York Law School and Mr. Frank Helman, President, Otto and Fran Walter Foundation. The Legal Counsel addressed the question of "Rule of Law" from the perspective of the United Nations, the role of the Office of Legal Affairs, Accountability, International Treaties and Law of the Sea. He expressed his honor to give the annual lecture in honour of the distinguished lawyer Otto L. Walter, a famous graduate of New York Law School. The Legal Counsel recalled that, in 2011, the Secretary-General of the United Nations also presented this annual lecture. He recalled that the Secretary-General had noted in his lecture that “the United Nations stands with all those seeking to build societies where nobody is above the law and where laws are publicly promulgated, equally enforced and consistent with human rights”. 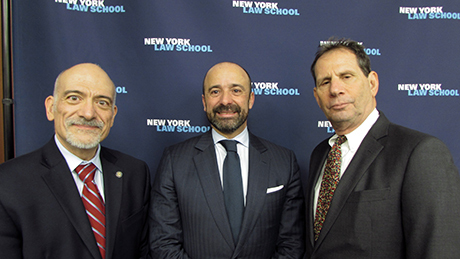 Mr. Serpa Soares (centre), with Mr. William LaPiana (left), Associate Dean, New York Law School and Mr. Lloyd Bonfield, Professor of Law, and Director, Center for International Law, New York Law School.